Sugar, both craved and criticized, proves an essential part of life. Your body uses sugar as its main source of energy and makes it possible for your cells to perform vital functions. Your body obtains sugar by breaking down carbohydrates during digestion. Pure sugar -- the kind you add to coffee and cereal -- enters your bloodstream swiftly. Sugar in foods such as fruit and beans enter your bloodstream slowly because it takes your body longer to break down these sources of sugar. Your body gets its sugar supply from the carbohydrate-containing foods and drinks that you consume. This is because carbohydrates are converted into sugars during the process of digestion. Carbohydrates are found in a variety of food items, including fruits, nonstarchy vegetables, starchy vegetables, beans, lentils, milk, bread, pasta, cereal, rice and nuts. Carbohydrates are also found in processed foods that contain added sugars such as desserts, baked goods and candy. The process of breaking down sugar begins in your mouth. When you put a carbohydrate-containing food inside your mouth, enzymes from the saliva in your mouth begin to break down the carbohydrates. After you swallow your food, it travels to your stomach where digestion awaits. Your stomach breaks down carbohydrates into sugar molecules. The sugar molecules pass through the lining of your stomach and get absorbed into your bloodstream. 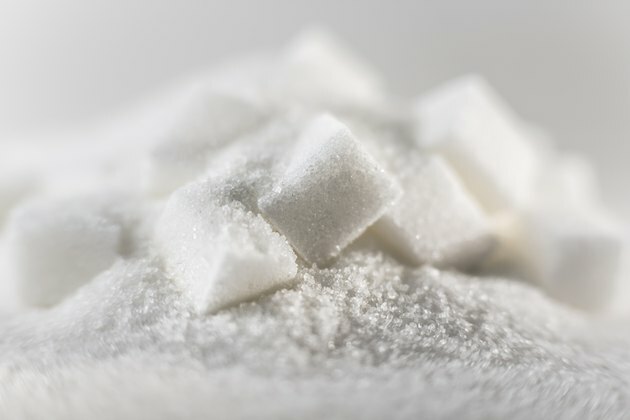 After carbohydrates break down into sugars and get absorbed into your bloodstream, the sugar molecules are delivered to cells throughout your body. The hormone insulin helps ensure that the sugar molecules are transferred from your bloodstream to your cells. When your blood sugar levels get too high, your pancreas secretes insulin, which sends the sugar molecules in your bloodstream to your cells. Your cells use the sugar molecules for energy to function properly. Carbohydrates are often grouped into a single category, but they include three distinct types: sugar, starch and fiber. It is important to note that only sugar and starch carbohydrates get broken down into sugar molecules. Fiber is not converted into sugar, but rather, it passes through your body without being digested. The combination of sugar, starch and fiber carbohydrates make up what is known as your total carbohydrate intake.